Yes I LOVE Horses, all my friends say I am horsecrazy! Sometimes people will even say I am "obsessed" With horses! Well, I think I am truly "obsessed" Haha! Horses have been a part of me my whole life. When I was 8 I started to take lessons on jumping. I love to jump! It is a great rush of excitement, even when I'm just practicing. I think jumping horses or barrels are so great, because the horse and rider become one. It's like you both love what you're doing and want to do your best all the time. I have a horse of my own I got him on September 5th 2010. I haven't had him long but oh my gosh he is a marvelous horse! His name is Comet and he is a registered QH. 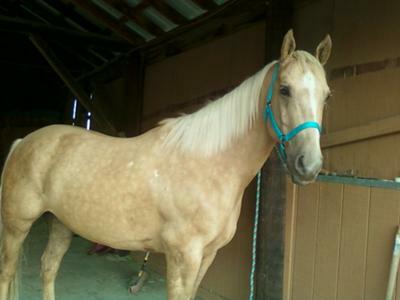 He is a Palomino and is 8 years old, yes he is a gelding. Horses to me are beautiful animals. They come in so many colors and are so powerful! Horses can be your best friend and I absolutely LOVE that... A horse can not only be a best friend or something that works for you, they can become you. Some of my friends believe that your horse and kinda "act" like the owner. Horses can be great sport companions! I love my horse because he loves sports just like me! Comet and I hate taking days off and when we see each other again it's almost so exciting, it's like we are first meeting again. I know boys are never "BEAUTIFUL" as such but this is definitely an exception!!! ohh.. you have a gorgeous horse!